Sometimes it’s helpful or even necessary for a parent to move in with a child so that the child can keep an eye on their parent or even care for the parent. This quite often can be to the mutual advantage of all parties in that while health and stamina prevail the parent may be prepared and inclined to do some babysitting while the grand children are young. Whatever the reasons, many people enter into family arrangements. They are largely informal. For a whole range of reasons such arrangements should be documented. · The older person is disadvantaged enormously in being left with little or no means to go elsewhere or even to consider paying a bond to move into an aged care facility, if things don’t work out. · The pension is unnecessarily affected by failing to get legal advice and think through the legal issues. · The child who undertakes the care ends up being demonstratively worse off. · The older person is happy and content with the arrangement as is the child who is carrying for the older person, but inadvertently other children “miss out” under the Will because of a lack of careful planning. · The child who cares for the older person is accused of taking advantage of the older person and is shunned by other members of the family (this can often be avoided by a more transparent approach and consultative approach so facilitated by a solicitor who has a working knowledge in elder law). 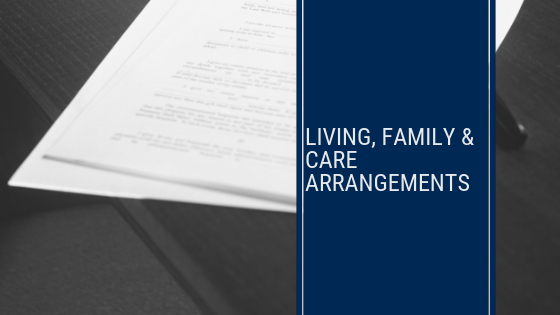 We are able to assist in carefully and thoughtfully documenting family arrangements. A care arrangements for older people through family members can be a great way to maintain family closeness and ensure the care is appropriate in all the circumstances. Sometimes a family member who put themselves out to undertake such care is inappropriately vilified for doing the wrong thing. For the sake of there being no misunderstanding among the family as to the motivation of a family member in caring for an older person and indeed for the older person in choosing to live in one household as apposed to another, it is our experience, that it is best for there to be open discussion (if that is at all possible). We can facilitate that open discussion. Secondly, it is our experience, that it is best to document care arrangements. Once again, so that there is no misunderstandings. Further, sometimes it is necessary for older people to go into aged care facilities. This should never be seen as a last resort. The operators of aged care facilities present a whole range of documentation, which they suggest is standard and should simply be signed. Sometimes the suggestion is that the bond is derived by some act of science and it should just simply be paid with no questions asked. It is our position, that questions should always be asked and that everything is subject to negotiation. We are able to assist people in advising on care agreements with aged care facilities and with also the calculation of bonds. As older people age, it is important to examine how best to live a comfortable and healthy life. Sometimes this is possible at one’s own home. Sometimes due to care requirements this is not terribly practicable or it could lead to the older person becoming more and more isolated and lonely, which if the older person were honest with themselves is not a happy outcome either. Sometimes it is helpful to consider moving in with family. That should not be done lightly as it may create a new dynamic that no-one is used to. If it is to be done, then it should be documented under afamily arrangement and the whole process should be thought through carefully. Sometimes it is helpful to consider aged care facilities where there is the ability to be around other people to meet social needs and where care needs can easily be met through nursing staff, medical staff and other allied health professionals.